Good news for Twitter users who are looking to measure the activity you are generating on social media more accurately: Analytics is coming your way. Yesterday, the social networking site did a test-run of their built-in analytics feature on their advertising page. They have since taken down the Analytics section, but according to Twitter, they are pleased with the results, and they are deciding what to do next. An Analytics tab temporarily appeared yesterday on Twitter’s Ads page. The analytics interface is easy for users to understand, with a graph on top and a table at the bottom. The graph on top shows activity on your Twitter page – how many mentions you receive, how many follows and unfollows over a given period. The table below shows the most recent tweets and activity related to it – the number of favorites, retweets, and replies each tweet received. 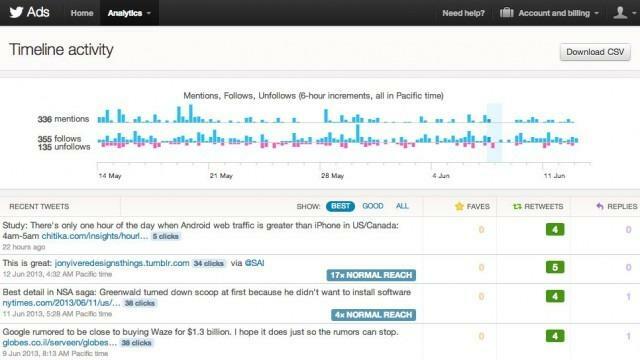 Further into the Analytics interface, you can check information about your Twitter followers. 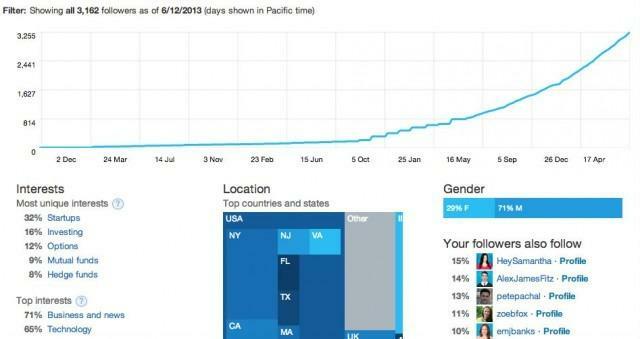 The system shows your followers’ location, gender, and interests. Above these statistics is a chart tracking your follower growth. Third-party Twitter analytics trackers will find themselves in a difficult position if Twitter decides to make this analytics feature available to all users free. While these companies provide some of the information that Twitter Analytics offers, an in-house analytics tracker will still provide a more accurate count because the information is shared internally. In addition, the in-house analytics tracker will be easier to access – no need for separate websites for tracking activity. If you’re using paid analytics tracking tools now, you will also be able to save money if Twitter makes Analytics free for everyone. In the meantime, you can start pushing traffic to your Twitter account and use it as a marketing tool through our social marketing solutions. We’ll help track your Twitter activity and think of ways to increase your interaction with followers. Talk to us today to get started.